Jobstreet.com's newest handbook has pointers perfect for every Cosmo career girl. Make sure you have a rockin' resume when applying for that dream job! We're sharing what we read on Jobstreet.com's handbook, Jumpstart Your Career, for some useful things every Cosmo career girl should keep in mind. Remember: most of the time, an employer’s first impression of you is your resume, so don’t take it for granted and make it count. Keep it short. One to two pages will do. Tailor your resume to suit the job you’re applying for. Get another person to read your CV for spelling, grammar, and typographical errors you might have missed. Use bullet points and strong, clever words to catch the attention of your recruiter. Mention that a list of references is available upon request. This way, your future employers know that they can easily call someone if they’d like to do a background check. Use an unprofessional e-mail address (ex. sexybabe@yahoo.com). Use fonts that are distracting or too small in size. If you do, you’ll just tempt the reader to skip to the next applicant's resume. Submit a photo if it’s not required to avoid partiality. List the number of a reference without asking his or her permission first. If they’re caught off guard, it might work against you. Clog someone’s inbox with a heavy attachment. Make sure the files you send are less than 1MB in size. 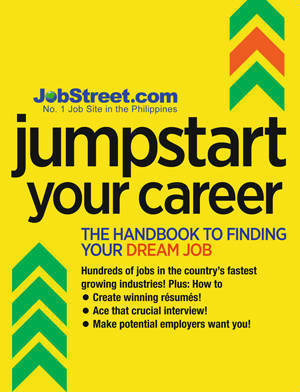 For more resume tips, get your copy of Jobstreet.com's Jumpstart Your Career: The Handbook to Finding Your Dream Job, available at all leading bookstores and newsstands for P195.